An excellent way to grow bromeliads in the greenhouse or conservatory is in a permanent bed specially designed for them. This is easily constructed with wooden boards about 9 inches (23cm) wide, which are placed on the floor of the greenhouse to make a rectangular frame of the required size. Set a couple of dead tree branches or artificial trees (see my Making A Bromeliad Tree post) in the middle and then put a layer of broken brick in the bottom of the frame to a depth of about 3 inches (7.5cm). Finally, fill the frame with a mixture of equal volumes of coarse sand and moss peat. The trees may be planted with Tillandsia and other epiphytic plants and the bed below can house the more shade-loving bromeliads. Many other plants, like begonias, geserias and ferns, will also thrive in such a planting. I just bought 2 bromeliade plants, and I’m not sure how to handle them. There color is an orangy red if you need that for a form of identification… When I first set them out, I had them in an area that got alot of sun, and they weren’t doing well so I moved them to a shady area under a tree… My son bought me another one for Mother’s Day and it’s still in the house… My question is that I noticed that the ones I bought and the one my son got were in pots without drain holes… Is there a reason for that… I live in Fl and my whole garden area is sand, what special care will they need? Also I go up north for the summer 3 – 4 mos. My bromeliad flower is starting to dry out, but I have had it for many months-indoors. I know it needs repotting, but does it need drainage. How should I pot it and how should I feed it? Bromeliads do not get their nutrients from the soil. Make sure you are watering into the center and base of the leaves. It does not like really hot direct sunlight. 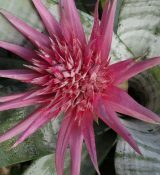 keep indoors, bromeliads are tropical and cannot survive a northern winter. I have a bromialed that is starting to dry out. WHat do i do? How do I repot this plant. With glass stones on the bottom? When the bromeliad flower dries up, should it be trimmed off? My yellow flower has died , so is it best to just cut the dead flower off or trim back the whole plant? @Jackie: You want to cut the stalk as low as possible without harming the rest of the plant. This allows the bromeliad to focus its energy on producing pups. Have planted 3 bromeliad plants in plastic pots to stay outdoors. They have been planted like most plants. Have I chosen the wrong plant? I just potted some guzmania in backyard. After reading the permanent planting I’m wondering if I set the plant in the crook of my live Palm trees if the roots would grab hold as it sounds like it is how it would grow in the wild? I live in Hawaii so my climate is good and the tree would give it the propped shading. Yes that would probably work out just fine. You’ll need to help anchor it with twine or (non-copper) wire until it is able to attach itself to the tree on its own. When one bloom dies, when will another appear. How do I make it do this? The same plant won’t flower again, but its offspring will. See A Beginner’s Guide to Bromeliad Pups for more on this topic.